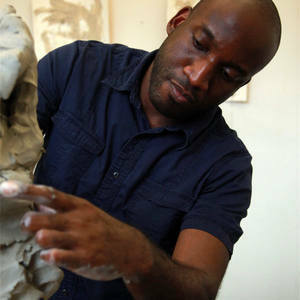 Ebitenyefa Baralaye is a sculptor, mixed media artist and designer. He received a BFA in Ceramics from the Rhode Island School of Design (2006) and an MFA in Ceramics from the Cranbrook Academy of Art (2016). Ebitenyefa has held residencies at the Peters Valley Crafts Center, The Elizabeth Foundation for the Arts, and Talking Dolls. His group exhibitions include the 2011 Gyeonggi International Ceramix Biennale. He is currently represented by David Klein Gallery (Detroit, MI).